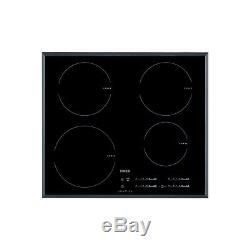 AEG HK654200FB 60cm Touch Control Induction Hob - Black HK654200FB. 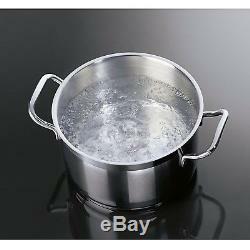 Safer for the home, heats the pan not the hob surface. It's more energy efficient as it won't provide heat unless it detects a pan. Easy to use and clean touch controls. Speedy cooking with the AutoMax function bringing zones quickly up to boiling point. Oko Timer enables you to use energy more efficiently, using residual heat in the last few minutes of cooking. 14 Stage digital power level displays, keeping you informed at all times. The stop and go with keep warm function is ideal if your cooking's interrupted. If you leave a cooking zone on it will automatically switch off after a period of time. This AEG induction hob brings flexible cooking to your kitchen. The stylish design will fit in to your kitchen seamlessly and the super smooth surface alongside modern touch controls, makes it super easy to wipe clean. It has four cooking zones in a variety of sizes to fit all your different pots and pans. And there's 14 power stages, something to suit every dish. It features an intelligent AutoMax function which brings cooking zones up to the boil and it will then reduce the heat to a pre-selected power level for the remainder of the cooking time. Being induction, this hob is much safer and more energy efficient for the home. 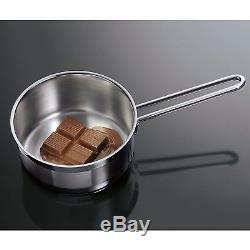 It creates a magnetic field between the hob and the steel or iron pan. This means it is the pan which is heated, not the hob surface. There will be some residual heat, but the hob will let you know when it's cool to the touch. This smart hob wont waste any energy trying to heat up until it detects a pan, which is ideal if you've placed your pan on the wrong cooking zone. It's packed full of tech to reduce the amount of energy you use when cooking. It has an Oko Timer, this enables you to use energy more efficiently by using the hobs residual heat during the last few minutes of cooking. Each cooking zones residual heat is monitored by an OptiHeat control, this way you can make the most out of the remaining heat. There's also a handy CountUp timer which starts at zero and keeps counting up until you stop or reset it, letting you easily monitor the progress of your dish. If for any reason you have to stop cooking there's a handy stop and go with keep warm function, when you return to your dish the hob will resume to its previously selected settings. There's a child lock for added safety, so no settings can be accidentally modified and if you happen to leave the hob on, there's no need to worry as it will automatically switch off after a period of time. Dimensions: H5 x W59 x D52 cm. 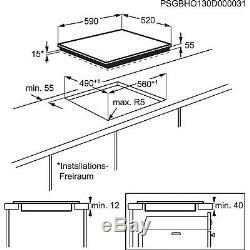 Counter cut out space: W56 x D49 cm. 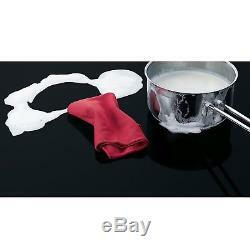 Flexible and energy efficient induction cooking. 14-stage digital power level displays keep you informed at all times. AutoMax function quickly brings pans to boiling point. Highly energy efficient, won't provide heat until it detects a pan. Oko Timer uses residual heat towards the end of cooking to be more energy efficient. OptiHeat Control tracks the level of residual heat. A stop and go with keep warm setting is ideal when your cooking is interrupted. Easy to use, highly responsive touch controls located at the front for easy access. 4 Cooking zones in a variety of sizes for all pots and pans. Residual heat indicators let you know when the hob is still warm to the touch. Stylish integrated design with an easy clean glass surface. Auto switch off after a period of time if the hob is ever left on. 204 customers have bought and rated this product, giving it an average score of. Our success has been achieved though purchasing at highly competitive prices and passing the savings directly on to the customer. Our aim is to provide customers with something many of our competitors fail to achieve: competitive pricing and a top-class service. Getting the Right Products for You Each and every order you place is checked by one of our experienced sales team. We'll take a look at your order and make sure that the products you have chosen are suitably matched. If we have any special offers or alternatives that we think might be a better suited, we'll get in touch to let you know and discuss the options over with you. If you'd like to pay by card, please have your e-bay user ID and item number ready and call 01484 448 969 with your card details. Nearly all orders arrive on time and in good condition but occasionally goods can get lost or damaged in transit, we do our best to prevent this by working the the highest quality couriers. The item "AEG HK654200FB 60cm Touch Control Induction Hob Black HK654200FB" is in sale since Wednesday, August 10, 2016.